Articles About Our Products and How They Work. The Problem With Red Wagons. What’s the problem with the standard "little red wagon”? Well, it depends on what you plan to use it to do. This old reliable product in either plastic or metal has withstood the test of time—it certainly works and transports cargo well. The problem is that the standard red wagon won't fit in most small car trunks as the wheels do not fold like a Pancake Flat wagon's foldup, patented wheels. (Try stacking two red wagons, for example.) The Pancake Wheel technology, with its compact, folding wagon and cart products provide the cargo benefits of a traditional wagon or cart, with the added benefit of easy compact, foldup storage. 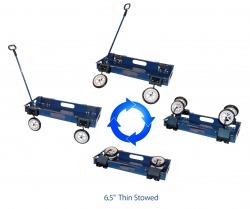 Only after Pancake Wheel invented the Pancake (R) folding wheel and related handle technology did many wagon and cart manufacturers take notice of consumer's desires for fold flat wagons and carts, but no other solid base wagons or carts compare to the world thinnest Pancake flat wagons and carts in terms of how flat they fold up. We have begun licensing our fold flat technology to savvy manufacturers so look for our products for sale! During 2011, Pancake Wheel licensed our folding handle designs to Radio Flyer as Radio Flyer recognized that consumers desire to fold wagon handles out of the way. Our fold flat handle provides holding positions for the folding handle so it won't drag on the ground, and even better, the handles folds flat right inside the wagon when not used. Jogger Truly Folds Flat - Unlike Other Jogging Strollers. Our unique revolutionary 7-inch thin folding jogging stroller has created a completely new standard for jogging strollers. The wheels simply fold up and the user has a “pancake flat” product to pop in a vehicle for transport or to place flat against a wall for storage. Other brands of jogging strollers say they collapse flat, but they must first be folded in some way and then the wheels need to be detached to fit the jogger into most vehicles. The US patent office has granted 3 patents already and more are pending. Unlike other joggers, with the best folding Pancake Wheel Jogger, you just fold both the front wheel and the rear wheels inwards with a proprietary folding system. Pancake flat and ready to go in the trunk of even a sedan in seconds! See our world's thinnest folding jogger on Youtube.com [type in: Pancake Wheel jogger]. Update 2016: Pancake Wheel co-developed and co-invented the Nikimotion Blade baby stroller first introduced in Europe. Pancake Wheel's Best Folding Travel Wagon: How It Works. 3. Fold wheel back out to latch. Simply the best folding wagon wheel system in the world!